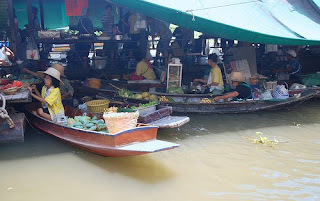 One of the places I am really excited to visit is the Taling Chan Floating Market in Bangkok. It is located on the Khlong Chak Phra canal in Bangkok. Vendors sell their wares (fruit, vegetables, orchids, fish, etc.) from their boats and will bring it to you. Who needs Pizza Hut!? All I can say is gimme!! As I mentioned earlier, I love fruit and veggies, however I have a special place in my heart for carbs (what girl doesn't?!) I never understood the whole chocoholic thing, give me a slice of bread or a slice of pie and I am the happiest girl in the world. One of the things I am looking forward to the most while on our trip is eating some of my favorite foods in the places where they hail from. One of the foods on the top of that list would have to be naan bread. Our local tandoor makes some AMAZING naan. I love the crisp yet tender texture, and the richness from the ghee that is typically brushed over it. When we go to the tandoor we can't really see them make the naan, and I want to learn how to make it since I already know how to eat it! 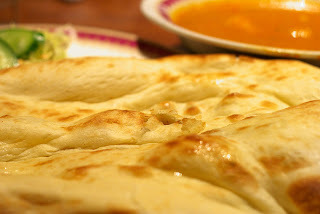 I am partial to the to the Kashmiri naan, its like the Indian version of the poptart, but better. I am excited to see them made in person and eat them until I can no longer button my pants. lead you are going to have to roll me out of India! In my introduction post, I went on and on about how I love food but completely forgot to mention how I love volunteering. I think it is very important for me to help individuals that are less fortunate than myself, think of it almost as a duty. I think the whole mentality of service was drilled into me when I was a Girl Scout, and I haven't shaken it. So I volunteer at work sponsered events and I am an assistant Girl Scout leader. So when I came across this post on apartment therapy today, mye eyes lit up. We could volunteer on our trip! Volunteer globalization here I come! I checked out Globe Aware and they have programs during our trip in places we were interested in visiting. I would be hard pressed to pick just one and would want to volunteer at all of them. I am sure lead would veto it, it can be expensive but what an experience! I will have to make sure I pack my work gloves.